IBM (IBM) closed at $123.90 in the latest trading session, marking a +1.89% move from the prior day. The stock outpaced the S&P 500's daily loss of 0.15%. At the same time, the Dow lost 0.32%, and the tech-heavy Nasdaq gained 0.42%. Prior to today's trading, shares of the technology and consulting company had lost 2.6% over the past month. This has lagged the Computer and Technology sector's loss of 1.79% and the S&P 500's loss of 1.1% in that time. IBM will be looking to display strength as it nears its next earnings release, which is expected to be January 17, 2019. On that day, IBM is projected to report earnings of $4.86 per share, which would represent a year-over-year decline of 6.18%. Meanwhile, the Zacks Consensus Estimate for revenue is projecting net sales of $21.77 billion, down 3.45% from the year-ago period. 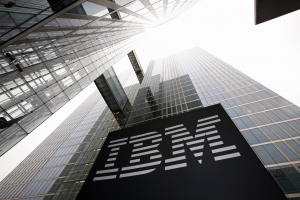 IBM's full-year Zacks Consensus Estimates are calling for earnings of $13.81 per share and revenue of $79.56 billion. These results would represent year-over-year changes of +0.07% and +0.53%, respectively. 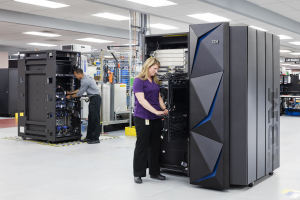 Investors might also notice recent changes to analyst estimates for IBM. These recent revisions tend to reflect the evolving nature of short-term business trends. With this in mind, we can consider positive estimate revisions a sign of optimism about the company's business outlook. The Zacks Rank system ranges from #1 (Strong Buy) to #5 (Strong Sell). It has a remarkable, outside-audited track record of success, with #1 stocks delivering an average annual return of +25% since 1988. The Zacks Consensus EPS estimate remained stagnant within the past month. IBM currently has a Zacks Rank of #3 (Hold). In terms of valuation, IBM is currently trading at a Forward P/E ratio of 8.8. Its industry sports an average Forward P/E of 10.17, so we one might conclude that IBM is trading at a discount comparatively. Investors should also note that IBM has a PEG ratio of 1.77 right now. The PEG ratio is similar to the widely-used P/E ratio, but this metric also takes the company's expected earnings growth rate into account. The Computer - Integrated Systems industry currently had an average PEG ratio of 1.77 as of yesterday's close. The Computer - Integrated Systems industry is part of the Computer and Technology sector. This group has a Zacks Industry Rank of 165, putting it in the bottom 36% of all 250+ industries.